Three years after his wife’s death, Public Defender Luke Rayburn is still struggling with loneliness and the trials of being a single parent. But when his son Michael decides he wants to meet his biological mother, Luke must face one of the biggest challenges of his life. Who knew, when they both meet the haunted, beautiful Meredith Hunter, their lives would get inextricably bound together? 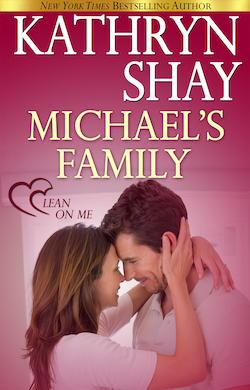 Full of hot passion and tender family scenes, as well as insights into some explosive legal cases, MICHAEL’S FAMILY is sure to tug on your heart strings. Once again, Kathryn Shay puts into words what she’s learned as a high school teacher. She also spent time with the public defender and a district attorney to research this book! — The Literary Times, Inc.